Very little that I carried with me ended up not being used. Examples are most of the first aid kit, a spare head-lamp, most of the duct tape, spare batteries and a t-shirt (partly because I could wash clothing more frequently than expected and partly because there was little point in getting more clothing wet!) Some of my meals in the first half went uneaten (see food below), so acted as unnecessary weight. Even with such little irrelevance in my pack, it still weighed 48.5 lb at the start. Add the 37 lb canoe plus paddles, poles and life-jacket, and my load initially and following re-supply was about 90 lb, nearly 60% of my starting body weight. Other than the occasional steep take-out, where I hoisted canoe and pack up the bank separately, I single-carried all portages except for Spencer Dam. They worked like clockwork: step out, secure paddle put on pack, hoist canoe and go. Being self-employed, when I stop working I stop earning. So taking out time to paddle the Trail represents a significant blow to my bank account. Furthermore, I have an obligation to my fellow band-members and to my fiddle students. Any time that I take for myself limits their activities. For those reasons, I have set myself the ambitious target of completing the Trail inside a month, requiring an average of about 25 miles per day. At the time of planning, I have to believe that I am capable of keeping this up day after day. The time of year is partly dictated by the same considerations, choosing a time other than our most busy gig season in the summer, as well as, importantly, when day-length will allow long days of paddling to cover the distance. Other factors taken into consideration are water temperature, volume of water (hence water depth and flow), day- and night-time temperatures, and abundance of biting insects. I have read too many stories of those who have been let down by a lack of water, necessitating far too much carrying, dragging, and negotiating rock gardens and cobble beds. So late summer, when the water is warm, the blackflies are over and the mosquitoes are waning, although probably idyllic, is too much of a risk for me. Late spring is the most likely time that I shall have enough water for my liking (my start date is 19th May). It has not escaped my attention that I shall probably start in blackfly season and gradually progress north, remaining in blackfly season for the entire trip. Here's an opportunity to learn to live with them; a month of loathing is not going to be good for my blood pressure! Update (10th May): My expectation that the rivers would still be supplied by snow-melt has been dealt a blow by the recent run of very warm weather, and the lack of spring rain does not bode well for full rivers. The 28 day schedule that I set out with proved spot on. I could have finished a day sooner (or maybe 2 with extra effort), but my support crew had obligations which dictated the finish date. The large average daily mileage was not onerous. It required not so much a large effort as a preparedness to paddle for many hours each day. Of course, some days were strenuous as well. The blackflies and mosquitoes were my ever-present companions, other than when the wind blew really hard or the rain came down in torrents, which, come to think of it, was quite a large percentage of the time! Still, the bugs caused me much frustration. The weather update (10th May) referred to the lack of rain in late April and the first two weeks of May, causing me serious worry about water levels. My worry was unfounded: May turned out to be the wettest on record in Vermont. June followed suit, also the wettest recorded in Vermont (and maybe in New Hampshire and Maine where I had reached by then). It's true to say that there was more water than I had expected - a LOT more. Upstream, especially on the Missisquoi but also on the Clyde and Upper Ammonoosuc, was very hard going as the rivers were in flood. The silver lining was that downstream sections of whitewater, such as the Dead River, were mainly paddlable, and the difficult haul up Spencer Stream was deep enough to pole and paddle for parts and to float the boat while wading. With seemingly increasingly erratic weather patterns, it's impossible to know when is the best time to paddle. Much as I may complain about the hostility of the weather - and it was truly hostile for much of the time - the time of year was probably the right choice for me. This quest is a challenge not only for me but also for my canoe. I am going to use a cedar-strip canoe of my own design and construction. 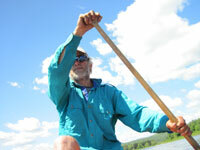 Part of my living is to custom-build such canoes, doing business as Otter Creek Smallcraft. The boat I shall use is a 14' solo version of my Sylva design, built in the spring of 2012. It has a touring hull with a little initial instability in the interests of cruising ease, and also an asymmetric hull with greater buoyancy aft of centre, allowing me to sit aft of centre without being too stern-heavy, and therefore still allowing a centre thwart to act as a carrying yoke. I'll adjust trim by the placement of my pack in the bow. This boat originally weighed only 35 lb, another reason to use one of my own boats, considering the 55 miles of portage along the Trail. I've reinforced it with extra fibreglass along the keel line and in the main strike zones to offer some protection against rocks, and it now weighs 37 lb. With paddles, poles and life-jacket secured inside for carrying, the total will be a little over 40 lb. Maybe a cedar-strip canoe is not the ideal boat for this trip. There again, there is probably no single boat which is good for large exposed lakes, intricate whitewater and carrying. I shall, at least, treat white water with some caution: aborting the trip due to a wrecked boat is low on my list of priorities. The canoe was amazing. Whether riding the swell of Lake Champlain, or rock-dodging (mostly) down the Dead River, or battling up the rapids of the Androscoggin, this canoe performed beyond expectation. The hull never gave me any moments of instability, important in the conditions that I faced, and allowed me to cruise at about 4 mph in good conditions, making long mileages a possibility. The main weakness of performance was going upstream in rapids: the keel-line in the bow tended to catch the flow, there being insufficient rocker to ride above it, making steering difficult, mainly while poling. Carrying proved to be no problem. And I was glad of the light weight for the more awkward portages (e.g. before Sheldon Springs Dam, Spencer Dam). The work that I had put in beforehand to stow poles and paddles easily, ensuring that the canoe remained balanced at the centre thwart, was invaluable. It's one thing to carry a canoe and pack for 7 miles (Day 11), but quite another to wrestle with an unbalanced load over that distance. There's no point in making hard work any harder if the application of a bit of thought can prevent it. The damage? A 10 inch and a 2.5 inch split in the interior fibreglass from rock collisions (both taped for the duration), broken seat rails on Day 6 (lashed for the duration) and scratches and scapes, more from upstream poling and wading than from paddling. Back in the mid-1990s, around the time of restoring the wrecked stripper that got me into all of this in the first place, I carved my own paddle out of a board of ash. Truth to tell, it's a bit long for me, and has a monster blade, but it has become part of my paddling. The long, relatively narrow blade is great for deep water, and the length allows me a slow, relaxed cadence. My single-blade paddling has grown around this paddle, and, over 15 years on, having seen much use, some abuse, and a few re-finishes, it's still going strong. For shallow, rocky conditions, I have carved a spruce paddle, reinforced with cherry. This is lightweight to carry, is much shorter and therefore more manoeuvrable than my touring paddle, and, to a certain extent, is sacrificial for use in whitewater. Much of the time it will be secured in the bow, within reach if necessary. My large paddle performed to expectation, propelling me with ease, offering great resistance against the water and the control that comes with it. It is my paddle of choice, always. My shorter paddle, by comparison, was clunky, messy on entry into the water and not very satisfying through the water. I built it to be robust rather than for performance. But I used it more than I had expected, and was very grateful for it. It gave me the confidence and ability to tackle some of the white-water sections that a long-bladed paddle would have precluded. Sure enough, the reinforcing cherry tip took a bit of a beating and ended up somewhat frayed, but that was it's purpose. Having packed a lightweight tent for many years, I've now adopted the habit of hanging from trees overnight in a camping hammock. No longer do I have to search for level ground with no rocks and tree roots. All I need (and easy to find in the Northern Forests!) is a pair of suitably spaced trees. Straps protect the bark, and my impact on the ground is minimal. I find this a comfortable alternative to hard ground. Furthermore, my hammock weighs in at 38 ounces, including the tarp, and there are no rigid parts (poles, stakes, etc) so packing is easy. I selected the Blackbird hammock and Edge tarp from Warbonnet Outdoors. The hammock has a dual layer underside, allowing insertion of a sleeping mat for underside insulation (I haven't got to grips with under-quilts yet). What happens when there are no trees? I'll cross that bridge when I come to it! Maybe I'll just suspend the tarp over the canoe and spend the balance of the 24 hours there! I spent 15 of 27 nights in my hammock, and it performed well. The only times that I got wet, despite intense and prolonged rain, were due to the tarp coming untied (my fault) and to rain splashing up from the ground (I couldn't hang it higher and still reach it!) The big limitation of a hammock, compared with a tent, is that there is really nowhere to retreat to when the weather is foul. Sometimes I hunkered down under the tarp before stringing up the hammock, sitting on wet ground; the only alternative was effectively to go to bed. Using it open as a seat, whilst possible, was inadvisable due to insect invaders. My use of a Thermarest for underside insulation was essential, some of the nights being very cold indeed. At no point did I lack trees, and sometimes had a smug feeling of being able to camp where pitching a tent would have been more or less impossible. One of the first practical bits of planning was to purchase the complete set of maps from the NFCT office, as well as a guide book. There has followed much time comparing maps and guidebook with Google aerial imagery. Being essentially a cautious person, I've drafted my own route description, with mileages, towns or other significant locations, portage options, notes about rapids and whether I should even think about running them or just aim to portage or line or track with no further ado, places to top up with food or water, places to camp, and so on. This process is mostly about thinking through the Trail and trying to foresee any difficulties that may arise. Whilst I know that I can never plan for all eventualities, the fewer of these that take me by surprise, the greater are the chances of success in completing the trip. This was perhaps the bit of planning that proved most worthwhile. Rather than peering at the map, wishing that I had more detail or access to the Internet, I had already asked and answered many of the questions that would arise. Even so, I should perhaps have researched more the resources along the way, such as accommodation, rather than planning to be stubbornly independent. My departure from the main route to head up Caucomgomoc Stream and via Allagash Lake was a reach for my confidence, as I had done no research on this section. It was good to find that the map and its route description served me well there. Paddling solo has inherent risks. There is no-one to fall back on, no-one to rescue me when the wind capsizes me in the middle of a large lake (it hasn't happened yet), no-one to patch me up after I slip on rocks and twist an ankle (or worse), no-one to help read the map to sort out exactly where I went wrong paddling upstream (always a challenge). The simplest response to this is to be more cautious than I might otherwise be in a group; not to risk the exposed crossing when the wind is questionable; not to risk the rapid that I might run perfectly fine, but who knows; not to risk jumping on to that rock which looks OK from here; and so on. Quite simply, putting one foot wrong can make the difference between success and disaster. I shall wear my life-jacket for any whitewater and for all lake crossings, even though I habitually don't wear it when within easy reach of land. I shall wear it, too, when lining or tracking through rapids. Now attached to my life-jacket are an emergency knife for cutting away tangled lines should lining or tracking go awry, and a whistle for attracting attention, should I end up swimming and anybody else be nearby. I recently took a Wilderness First Aid course at SOLO in Conway, NH. Whilst this was primarily for the summer camp where I work on the canoeing programme, it was also a useful refresher for my own purposes, and has informed a few changes to my first aid pack, amongst other things. I shall carry a cell-phone, not primarily for use as a phone (there's no reception for much of the Trail, judging by coverage maps) but more as a store of downloaded maps which, together with its satellite-based locator, can tell me exactly which wrong turning I've taken before I wander too far. I shall also be carrying a SPOT Satellite GPS Messenger. Not only can this summon help in the event of emergency, it can also be used to send pre-ordained messages to pre-selected email addresses, complete with latitude and longitude at the time of sending. This allows me to check in regularly with friends and family, letting them know that I'm OK, or that I need assistance. Part of the planning process has involved working out what these messages should say, and how I can communicate alternative messages by using various combinations of them, as well as what course of action is appropriate should the messages suddenly cease. The solitary nature of this trek was always on my mind, and so I did indeed take extra care with footing on wet rocks, for example. At no point, though, did I have to question whether the conditions were too rough for me; even on Lake Champlain, the roughest of the crossings that I made, I judged that my competence was well up to the task. Of course, everybody has their own level of comfort, and some would rightly have shied away from those conditions. Knowing my abilities and my canoe's handling gave me the confidence to venture out into substantial swell and chop. Mostly I was good, and wore my life-jacket for white-water and lake crossings. On calm days on large lakes, however, I confess to going without. There again, I wore it in the flooded conditions of the Missisquoi - for both safety and warmth. The whistle went astray somewhere along the trail, and the emergency knife saw no use. My first aid skills were rarely called into action. Loss of skin on a heel (Day 1), a sliced finger on the Allagash Stream (I still don't know how) and a couple of blisters from a particularly heavy day crossing Lake Champlain were the extent of injury, requiring only taping, as did the multiple splits in the skin of my hands from long exposure to cold wind and rain. My cell phone, which uses AT&T's network, worked in a few places as far as Island Pond. Beyond that there was no signal. The downloaded maps, which were my main reason for carrying the phone, proved either unworkable or unnecessary. In the Clyde Valley, the level of detail was never going to be a help, I realised once there, and the Spencer Stream to Moose River section was much clearer to navigate than I had supposed. I confirmed my location at the junction of Hardscrabble Rd and Spencer Rips Rd out of interest, not necessity. The SPOT worked well, although a few messages did not get through. My support team was able to get a fix on my position at regular intervals, and even requested more SPOTs in the second half. I know of many others who followed along online, trying to guess where I would end up next, and usually falling short! I never used any message other than "All's well", but it was comforting to have the option to call in the cavalry if necessary. I'm planning on only one major re-supply, after about 2 weeks when I reach the Connecticut Valley. That means carrying food for about 2 weeks at a time, other than what can be easily bought along the Trail. Breakfast is oatmeal, and dinner is various mixes of dried foods (bought as separate ingredients from Harmony House Foods). These merely require addition of water, and heating. They are prepared in separate portions in advance. For lunch foods other than the copious supply of trail mix, I shall graze along the Trail, stopping at General Stores to see what's available. This will probably be a bit like potluck. I shall also stop for a decent meal here and there, especially when the need for fresh salad overwhelms me! This was something that I got wrong. Two weeks' food, even dried, is heavy. Either more regular re-supplies or more reliance on grazing along the route would have been a better strategy. Furthermore, I under-estimated how much energy I would be using. The type of food and the portion size left me running a deficit each day. Not only did I begin to crave calories, I also developed a craving for protein. Clearly there was too little protein in my meals. Maybe it was the conditions, but I never found myself hankering after fresh salad - that came later, a few days after finishing. The other problem with my food was the ability to cook it - see Stove below. I carry a MSR water pump filter. This can easily be stripped down in the field to clean the ceramic filter, and I shall wash it with clean water when possible along the way. In addition to its own foam filter at the point of intake, I have inserted inline a Sweetwater SiltStopper. This has proved invaluable for protecting the ceramic filter from clogging. The paper filter can be gently brushed clean to increase longevity but the replacement filters, although expensive, are extremely light, so carrying some spares makes sense. Along the Missisquoi valley, bordered by agricultural land, there is too much run-off to use the water for drinking (physical filters don't remove nitrates, for example), so to cover that region I'll carry extra water, heavy though it is, in a collapsible water bottle. The water pump saw amazingly little use. When it was cold and raining, i.e. much of the time, I had little desire to drink cold water, and was probably sometimes dehydrated as a result. In most places that I stopped along the way, my first goal was to get a hot drink, usually chocolate. When camping, I boiled lake or river water to make hot tea in large quantities. Along the Missisquoi, even though I carried extra water, I never used it, each night having access to water and hot drinks, and not wanting cold water by day. The spare SiltStoppers remained unused. With hot weather, the story undoubtedly would have been different. I've spent quite some time searching for a lightweight, small stove, and there are several good ones on the market. In fact I have a great little burner which uses gas cylinders, and it does a fine job. So why am I not going to use this? Quite simply, I'd like not to have to rely on a fuel source which ultimately will run out (I'm speaking globally as well as in the context of this trip) and for which replacements may be sparsely available at best. To ensure not running out, I would have to carry too many spares, which goes against my ethos of cutting weight to the bare minimum. Recently I came across an ingenious and ultimately very simple design, called Emberlit. The online demonstration and reviews were so good that I ordered one, and trials have been successful. It's lightweight (the titanium version is under 5.5 oz), packs flat (now, there's a space saver in a pack), erects in a matter of seconds (yes, I've done it), and uses small pieces of wood, which are my preferred means of cooking (I like a small controllable fire for cooking, even if I have to tend it frequently, and small pieces of wood are much more available than larger pieces). The Emberlit works just fine, especially for a pot for one person, although is a little slow for a large pot. The one weakness in my plan to rely on this was that it works just fine ... when there is dry wood available to burn. With the weather conditions that I experienced, there was frequently no burnable wood to be had. At one point I could not even get birch bark to remain alight, such was the level of saturation. For this reason, I was under-nourished in the first half of the trip, sometimes resorting to trail-mix for dinner and breakfast, and there's only so much trail-mix that the body can process. In the second half, following re-supply, I carried the small gas stove that I had previously rejected, together with one cylinder. Whilst I used this on only a handful of occasions, it ensured that I always had a hot meal when I most needed one. In any future trip, I would probably carry both stoves from the start, but less food at any one time. Several people have asked me if I'm going to use wheels for portages. My answer is 'No'. Certainly there are many long portages which are wheelable, where a decent cart might make life easier. But there are two reasons for not taking this option. Firstly, I have read numerous horror stories of carts which have suffered mechanical failure. I struggle to believe that all have failed due to overloading or rough treatment. Secondly, the better quality carts weigh upwards of 15 lb. For the very many beaver dams and blow-downs to haul over, and the many portages which are not wheelable, that represents a significant extra load (not far off another 50% of my canoe's weight). With a light canoe and a pack, I typically walk at 3 mph on reasonable terrain; in other words, I am not struggling under the load. So I see no good reason to carry an extra 15+ lb of potential junk, merely to add some comfort here and there. If I were using a kayak or a much heavier canoe, maybe the equation would yield a different solution. Here's part of the planning about which I have no regrets whatsoever. Even on some of the longer road portages, I never found myself wishing for wheels. And when hauling up steep muddy banks or sheer rock faces, or carrying over rough trails, I was extremely glad not to be carrying several extra pounds of hardware. Yes, my feet and shoulders began to hurt on some of the longer carries, but that was temporary. I found that a minute's break after 20 minutes of carrying was sufficient to reset the discomfort clock in my shoulders. My self-made shoulder cups, bolted to the thwart, and much lighter than the commercially available ones, worked well, but have prompted a re-design for use when carrying a rucksack - another project for the winter. Perhaps the downside of carrying, as opposed to wheeling, is the loss of visibility - I missed the Alligator turning to Pond in the River and also the NFCT sign towards the end of the Demo Rd portage. Here's a related question: why are carry signs typically posted high up in trees ...? It's not easy to know exactly what kind of fitness is required for a trip of this nature. So much of the effort is likely to be mental, but even though a long day of paddling may not raise my heart rate significantly, there will be times when all out exertion is required, such as paddling up rapids. So my training has been a mix, including some running (for cardiovascular fitness), some work with free weights (because there will be significant lifting, especially during portages) and, since ice-out, some paddling. Much of my paddling has focussed on white water training, not only because this gives me a good workout but also because that's where my experience is most limited. Whilst I have paddled kayaks on water up to class IV, my canoeing has been mainly on lakes and placid rivers. A few pictures of me in action can be seen for the time being on a shared Dropbox page. Thanks to Rick Klein for wielding the camera. I've also recently put in a few long paddles in the 25 - 33 mile range, to toughen up the hands, wake up the muscles, and just to get used to a day "in the saddle". My shoulders have ached a little, but I'm otherwise unscathed ... so far. My fitness preparation lacked in only one area - carrying. I should have done more than merely carry the canoe and pack a couple of miles on level road once, a few days before starting. This might have averted the sore heel, and would certainly have overcome some of the leg fatigue in the early stages. Nevertheless, my carrying fitness increased markedly during the trip, to the point where long carries became routine, nothing to balk at. I was glad of my white-water training. This gave me the confidence to tackle the "closed" river in Plattsburgh and to reach the take-out below Swanton Dam, for example. And the long paddles certainly stretched out the muscles; I had no significant discomfort from paddling, even with a nearly-40-mile day on Day 2 (the longest of the trip). The mental preparation was paramount in the success of this trip, and is hard to describe. Knowing that you are indeed ready to take on a significant challenge is to be a long way towards succeeding in that challenge. Although I wrote nothing about this before departure, I had made plans. I had fitted long bow and stern lines, together with a removable strap to hold a ring under the keel-line as a point of attachment at the upstream end. I had practised briefly during some of my white-water training, enough to realise that this was a skill that I would need to work at in order to master. Frankly, I was not looking forward to having to guide the canoe in this manner. At no point did I guide the canoe by means of lines. Nowhere did I find a place where the banks were sufficiently clear to be able to walk while lining or tracking. My experience of wading told me that the cobbles were very slippery indeed. I would not have been confident about remaining upright while wading and controlling a couple of lines. When paddling, poling or portaging were not options, I waded with a pole in one hand as a walking stick for balance and the canoe in the other hand. This is another topic where I kept my plans to myself for no reason other than forgetfulness. I originally had ambitions to pole in traditional style, and made myself 12-foot sectional spruce pole with a ferrule joint in the middle. The more I thought about this, the less realistic it seemed to be. I was to paddle a narrow 14-foot canoe that most certainly does not have a flat bottom. Whilst I can stand in it, standing in rapids while pushing off uneven rocks was maybe taking things too far, possibly a recipe for disaster. It was on a canoe trip with Viveka late in summer 2012 that she suggested double poling. I tried then with two sticks, heading up a shallow but placid stream, and it worked. For the Trail, I refined this, taking a pair of downhill ski poles with baskets removed. I experimented with this only once before embarking, and made progress up some shallow rocky rapids locally. This was sufficient to give me confidence that it would be a viable mode of travel. The ski poles were a big success. Quite apart from acting as walking sticks for balance while wading, they propelled me up numerous upstream sections, notably the Upper Ammonoosuc, Spencer and Caucomgomoc Streams. When the water was too shallow to paddle effectively but still deep enough to float, the poles came out in preference to wading or carrying. A double poling action requires some upper body strength, and I found that kneeling was the most effective way to control the canoe. Directional control was difficult, partly because the keel-line of my bow was caught by the current. The poles also sometimes got wedged between rocks, requiring letting go to retrieve later, when holding on would have been the wetter option. Retaining the baskets might have made them more useful on sandy sections of the Upper Ammonoosuc, but might also have snagged more rocks. Two ski poles weigh much less than a 12-foot spruce pole and are easier to stow. They will be my choice in future similar circumstances. Somehow this also didn't make it into the recorded planning, although my plans were very clear. It was my intention to camp as much as possible, and to seek indoor accommodation maybe once a week for a hot shower. I had visions of being able to swim regularly, despite the cool water, and to be able to wash out clothes and dry them with ease now and then. I wanted to be independent and cheap, not being the type of person who spends lavishly or otherwise on hotels and the like. The rest day was already taken care of: I was to stay with Ray and Hildy in New Hampshire. That left maybe two other times that I would seek for and pay for accommodation, probably somewhere along the Missisquoi and then maybe in Jackman. What I did not allow for was the continuous nature of the foul weather. I'm not a fair-weather camper by anyone's standards, and indeed camped on at least ten very wet nights on the Trail, but the combination of cold and wet for many hours at a time told me that camping as much as I had planned would be a recipe for even more hypothermia than I actually suffered. I sought accommodation not merely for comfort but also in the interests of my health. In all I spent 5 nights in private houses (3 with Ray & Hildy), 4 nights in motels & inns, 3 nights under other cover (lean-to, shack, picnic shelter) and 15 nights camping. Far from resenting the additional, unplanned expenditure for motels & inns, I was extremely grateful for the opportunities to warm up, and happy to contribute in some small way to the local economies.